Dudes, you landed on this post and you’re probably wondering, “Is it even possible? Can I really learn how to make money on Pinterest?" Oh, but it is. It certainly is. You can still make money on Pinterest in 2018 if you implement the proper strategies and you know (at least a little) what you're doing. Have you ever recommended a product or service that you absolutely LOVE to a friend or family member? Have they ever started using it because of your recommendation? Now, imagine those companies paid you a COMMISSION every time you got a friend or family member to start using their product or service. That’s affiliate marketing. As an affiliate of a company, you can earn commission for getting the company new paying customers. Take, for instance, your favorite online course. If your online course runs an affiliate program, you may be able to earn a chunk of money every time you get someone to enroll in that course. Share your super special “referral link” with your friends and family. When they pay for the course, the company will be able to see it was YOU that referred them through the special link. And that’s when they’ll reward you with the fancy commission. But how does this relate to learning how to make money on Pinterest? So now that we got the basics covered, let's break this 3 step process down starting with step one. If you're not sure how to get started with affiliate marketing, you should take this course. I took it, it's amazing for beginners. It will show you how to setup the foundational aspects of affiliate marketing that will enable you to be successful. Check out this top rated affiliate marketing course. To learn how to use affiliate links on Pinterest, I recommend this really budget friendly ebook that I used to get started. It'll show you how to make your first sale within a few days. Now, the truly fun stuff begins. Once you get approved for affiliate programs and get access to your own unique affiliate link, you'll be able to start promoting. Head to Canva (free graphic design tool – yaaasss!) to create a super cute image. Click "blog graphic" so the dimensions will be good for Pinterest. Download the image (see top right) and saved it to my computer for easy access to start STEP THREE. 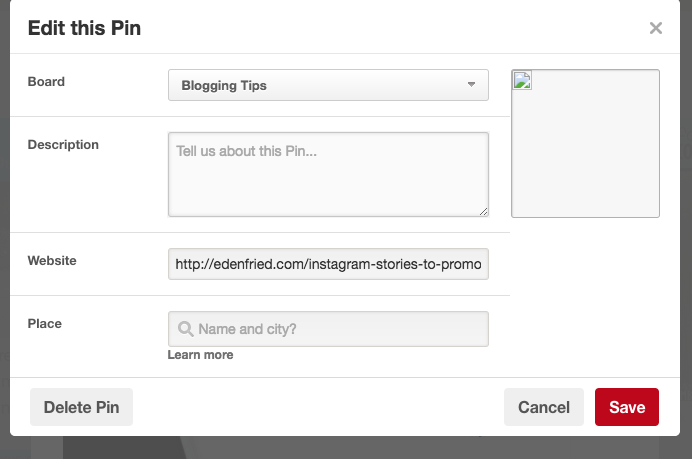 Now that you’ve created your pin and saved it to your computer somewhere, click the gray plus on your Pinterest profile and upload the pin to your board. Next, you'll be prompted to upload your image, and choose a destination website. THIS IS WHERE YOUR AFFILIATE LINK GOES! After you upload your images, choose the boards you'd like to pin to, and save! Next, go view your pin and click "Edit" in the top left with the pencil. This is where you can change the description of the post (load it with keywords and phrases and make it something eye catching) and make sure your referral link is correct so that you can make money on Pinterest!! So, you get the gist, but do you really have all the time in the world to sit down, make a bunch of pins and pin them all day to your boards and to other boards? So that's where this e-book comes in. ​This author is making over $500/month on Pinterest affiliate links alone. This resource which cost me less than one date night, does a really good job of guiding you to all the right tools and resources to help automate Pinterest, incorporate Pinterest affiliate links, and generally how to monetize Pinterest without a blog (believe it or not). You'll get a simple to understand process that you can easily reuse over and over again without much effort. Think about it. All you do is create a pin, add your affiliate link in the URL space, and then spread that pin widely across the Pinterest-sphere. It's that simple. 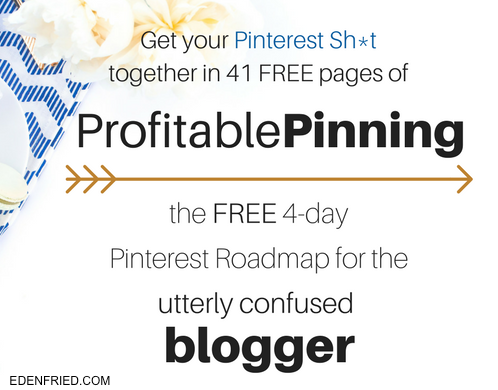 If you're wondering how to make money on Pinterest without a blog - THIS is how. With affiliate links on Pins. A lot of times when people hear about monetizing pins and making money on Pinterest, they assume that people are being paid by Pinterest. That's just not true. Does Pinterest pay pinners? The short answer: no. The long answer: no. When you share affiliate links on Pinterest, and people click on them and make a purchase, you will get paid your affiliate commission by the affiliate programs, not by Pinterest. If you want to get paid by Pinterest, you'll have better luck applying for a job through them, you know? You could either spend a lot of time perusing the web for the info you need, or you could speed things up by buying a resource that has the info for you in a neat and tidy package. The choice is yours! If you want the info you need quick and fast, here are my favorite Pinterest learning resources that our readers LOVE. So, to answer the question, “Can you make money on Pinterest?” – Yes, you absolutely CAN make money on pinterest. I’m not making this stuff up. Mayybeee it won’t come within 24 hours, but when you consistently pin images that direct you to your blog posts that have affiliate links, or you pin images that redirect directly to your affiliate product or service page, you’re golden. Main thing to keep in mind: don’t quit before the magic happens. You’ll get paid using Pinterest when you truly dedicate yourself to it. It’s a proven method and it works – so get started and let me know what you think!